Scytl congratulates the New South Wales Electoral Commission for receiving the 2016 Australian Government ICT Award in the Service Delivery category for the iVote® System supporting the 2015 State Government Election, clearly leading the way in Internet Voting and eDemocracy Innovation. 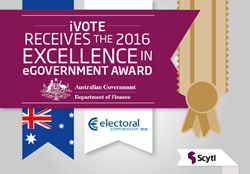 Scytl, the worldwide leader in secure online voting and election modernisation solutions, is proud to congratulate the New South Wales Electoral Commission for receiving the Excellence in eGovernment Award in the Service Delivery category for the iVote® System 2015 NSW State General Election from the Australian Federal Government for the 2016 Australian Government ICT Awards. The Australian Government ICT Awards acknowledge and promote excellence, innovation and professionalism in the use of Information and Communications Technology (ICT) across local, state and federal government agencies. This year, the Excellence in eGovernment Award was justly awarded to the New South Wales Electoral Commission as it clearly leads the way in Internet Voting and eDemocracy Innovation. Backed by the implementation of the world´s most advanced and proven security protocols provided by Scytl, the staggering figures of over 280,000 online votes, an increase of 500% in adoption, and praise from auditors, security experts and citizens, the iVote® System set the standard for the world’s largest, most accessible and innovative internet voting implementation. Scytl is the global leader in secure election management and electronic voting solutions. Specialising in election modernisation technologies, Scytl offers the first end-to-end election management and voting platform, providing the highest security and transparency standards currently available. Scytl has capitalised on its more than 18 years of research to develop election-specific cryptographic security technology protected by more than 40 international patents and patent applications, positioning Scytl as the company with the largest patent portfolio of the industry. Scytl’s solutions have been successfully used in over 42 countries across the globe over the last 11 years, including Canada, the United States, France, Norway, Switzerland, Bosnia-Herzegovina, the UAE, India, Iceland and Australia. Scytl is headquartered in Barcelona, Spain, with strategic offices in the United States, Canada, Brazil, Peru and Greece, as well as field offices in the UK, Ukraine, Mexico, Malaysia, India, Bangladesh and Australia. For more information, visit http://www.scytl.com.